Osteoporosis is a degenerative disease that weakens your bones and makes them porous due to the loss of calcium. Bone mass peaks at around the age of 35 years, then it begins to decline. People with osteoporosis typically lose bone mass faster than normal, increasing the risk of fractures in the wrists, hip, and spine following a fall or minor accident. Patients can control the pain and minimize its impact on their lives by including regular rest breaks in their daily routine. This can be in the form of sitting, lying down, taking a nap, or other ways of relaxing. 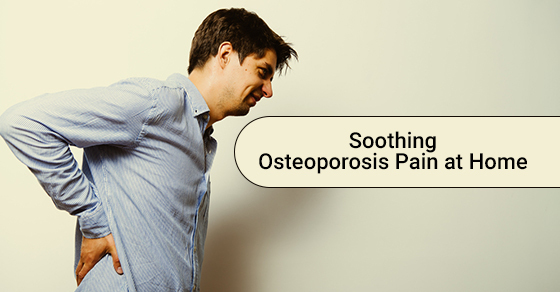 Physical TherapyThe pain from osteoporosis can make it hard to perform physical activities. However, being completely inactive will make you feel worse. To strike a good balance, you should consult with a physical therapist to create a personalized exercise program with simple movements to help build muscle strength and increase flexibility and range of motion. Exercise also promotes blood circulation, bone healing, and improves balance to prevent accidents and injury. Massage Therapy and AcupunctureWhile you’ll need to visit a practitioner outside of your home to take advantage of these services, these relaxation treatments can help ease pain and tension resulting from osteoporosis. Massage therapy and acupuncture are great techniques to help ease the pain you might be feeling in your joints and muscles. If you’re thinking about trying physiotherapy for pain management or to recover from an injury, it’s important to discuss these options with your doctor before contacting a local practitioner. It is important that you follow your doctor’s instructions to help ease pain and improve your quality of life when dealing with osteoporosis. Be sure to make the appropriate lifestyle and diet changes, like increasing your calcium and vitamin D intake to help prevent the chances of developing osteoporosis. For more information about dealing with osteoporosis at home, call Physiomed at (289) 925-3877 or contact us here.